Mostly from the area of Sideby by the Bothnian Sea, Western Finland. 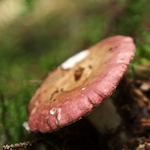 Cortinarius traganus (Fr. : Fr.) Fr., Gassy Webcap, haisuseitikki, bockspindling. E of Sideby. Clitocybe gibba (Pers. : Fr.) P. Kumm., Common Funnel, suppilomalikka, sommartrattskivling. E of Sideby.